Gnocchi and more gnocchi, and those are dancing in my plate and in my mouth… it’s raining again, so rainy days are gnocchi days. The good thing is that even if the process of making gnocchi can take a while, they’re so satisfying that after one plate of those gnocchi you don’t need anything else. They turned out to be bigger than usual and I ended up not striping them, probably because I was too hungry. The combination of the orange color thanks to the carrots, the light yellow of the sweet potatoes, and the green makes it a colorful but most of all delicious dish. As my dad would say who cares if it’s pretty, if it tastes bad? When it comes to gnocchi you can accomodate them with anything you want, like pasta. The difference comes in the composition of the dough. Traditional gnocchi are made with potatoes, then you can add ricotta, beets, spinach, pumpkin, etc…to make them colorful and add a twist to their flavor. I remember my cousin’s wedding I went to in Italy a few years ago. Where after all the appetizers and five dishes of the “primo” which is comprised of mainly all kinds of pasta, rice courses we got served an elegant dish of small gnocchi with shaved truffles. French people are not used to having pasta and another course after that, so they would probabily not be able to handle a festive Italian meal where about 4-5 courses of primo, is served before a couple of secondo, of meat and fish courses. I think you need to be trained to be able to handle it. Wash the potatoes, peel the carrots and steam them. You can also boil the potatoes with their skin in water. When cooked. When vegetables have cooled down, peel the potatoes, and in two different containers place vegetables and mash them into a puree separately. At this point, start making the prosciutto-leek sauce. On a flat working surface, add flour forming a volcano-shape , add mashed potatoes, one egg and salt, mix but not to the point of making an homogeneous dough, then take 1/3 of this mixture and add mashed carrots. at this point, you have two separate mixture, the potato mixture and the carrot mixture. Mix them separately, adding flour if necessary. If the mixture is too sticky and you are unable to manipulate it, add flour. When the two mixtures are ready and smooth, start making gnocchi. Take a little piece of dough and roll on a floured flat surface, making little sticks about 1 1/2 cm diameter, cut in small cylinders about 2 cm long. Always sprinkle with flour so that gnocchi don’t stick. Repeat the process until you have used all your carrot and potato mixtures. Bring water to a boil, add salt and add gnocchi. Cook until the gnocchi come to the surface. Remove from water and place in a large deep dish, and add sauce on top, mix well. Add the remaining parmigiano and sprinkle with parsley. In a pan, heat olive oil, add shallot, stir and cook until translucent, add crushed garlic. Wash and cut leeks crosswise, so that they form small circles. Add to the pan, and cook until the leeks are tender and soft. Add prosciutto, cook for about 10 min, until the flavors come out. Add salt and pepper. Add Cream and 2 tbs of parmigiano (keep the rest for sprinkling on top at the end), cook until the cheese has melted and the cream has thickened (about 5 minutes or less). This entry was posted by silvia on March 1, 2009 at 12:37 pm, and is filed under Pasta. Follow any responses to this post through RSS 2.0.You can leave a response or trackback from your own site. Love your cooking, versatile, elegant, and delicious. I have made sweet potato gnocchi before, but never with the addition of carrot. This looks delicious! I have typically paired it with a traditional brown butter sage sauce (yum! ), but am already in love with your prosciutto leek sauce. I agree that most North American digestive systems are shocked by the amount of food served in one meal in Italy. I know so many people (myself included) who have just ordered a primo as their entree and be done. I can imagine that the restaurant owners get a little frustrated with tourists! 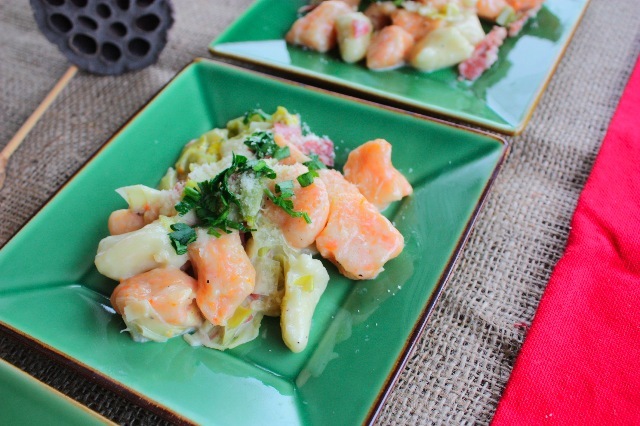 This is probably a healthier version of Gnocchi. Sweet potato has lower glycemic number than regular potato. And carrots is very healthy. Unfortunately, I had never had sweet potato and carrot gnocchi before;( Your food looks yummy. Looks yummy ! Thank you for sharing. Cheers !